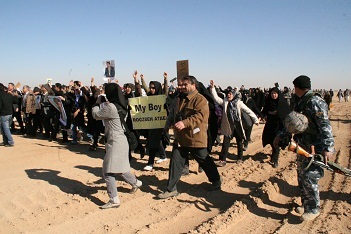 I am Ehsan Bidi, son of Mohammad Taghi. 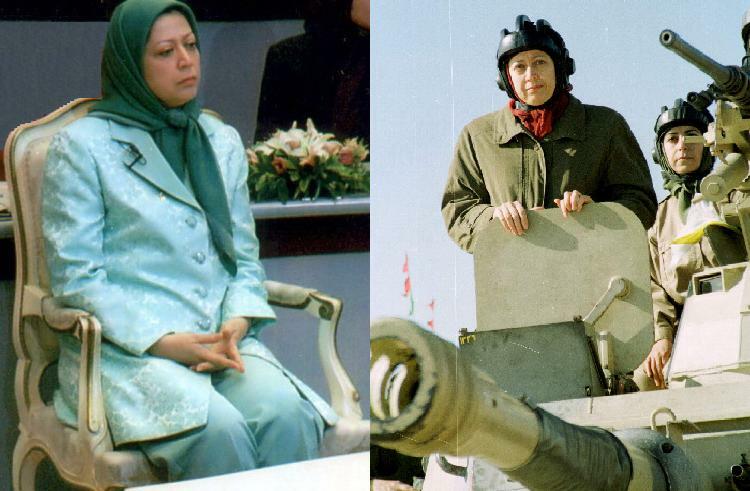 I declare my separation from the Mujahedin Khalq Organization (the corrupt Cult of Rajavi). I was deceived by the MKO propaganda and captured by the Cult, ten years ago. I spent ten years of best time of my life behind the bars of Camp Ashraf with no outcome. 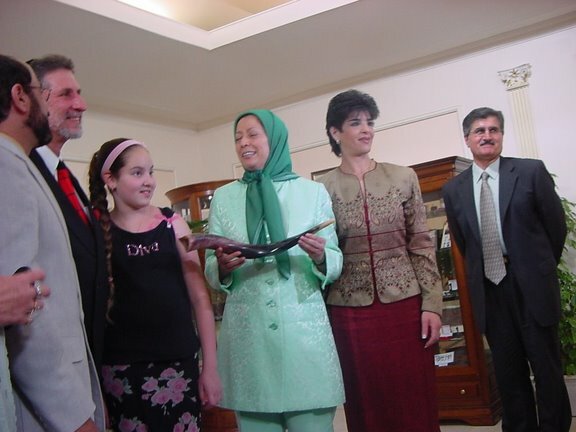 I was just imprisoned by shallow, vain promises of Rajavi and other leaders. As an Iranian young guy I noticed my mistake when I had no way out. I had no courage to express my opinion in the organization. 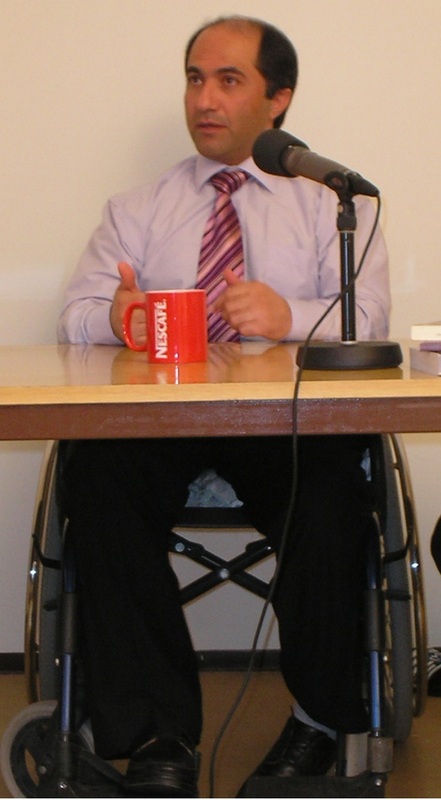 For the sake of the Cult leaders’ passions, I was shot and wounded in my leg on April 8th, 2011, during the clashes with Iraqi forces at Camp Ashraf. I was well aware that leaders of the cult would gain their evil goal only with shedding the blood of me and my friends. They never valued out lives. I decided to run away a few times, during the past years, but I didn’t succeed. When I was transferred to Transit Location, I was the first person to find the opportunity to escape the Camp. 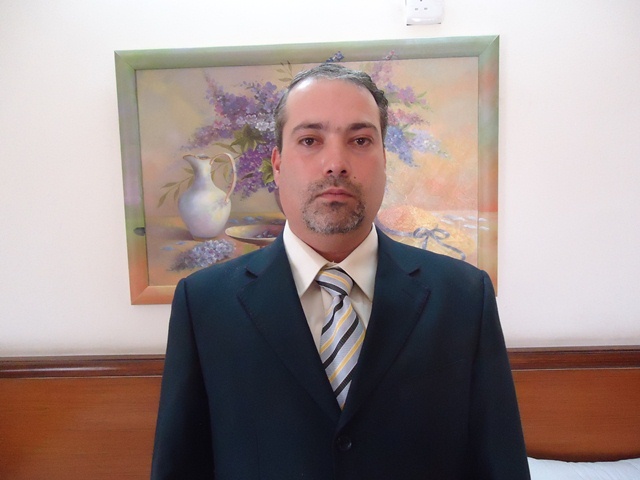 I submitted myself to Iraqi forces. I could finally release myself from the criminal corrupt Cult of Rajavi. Now I am very happy. My only desire is that the Cult leaders will be tried for the crimes they committed against Iranian youth and my friends who are willing to get liberated will be freed from the Cult. 400 more moved to Liberty: What must be done to reach “liberty”? 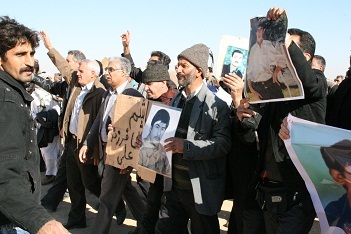 On Thursday March 8, 2012, at 14.00 hours local time, some 400 individuals of the Rajavi cult were moved to camp Liberty using 18 closed, protected coaches. 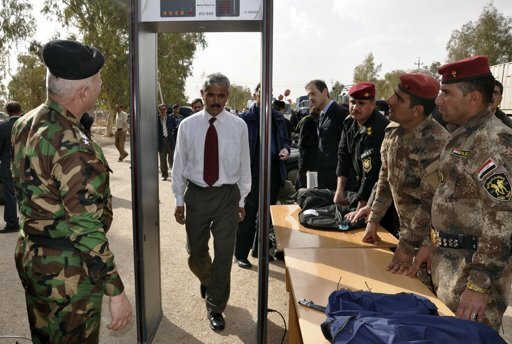 According to the agreement reached between the Iraqi government and UN officials, the MKO will initially evacuate Ashraf garrison and then the inhabitants will be transferred to another location in Iraq and then they will be moved to a third country. 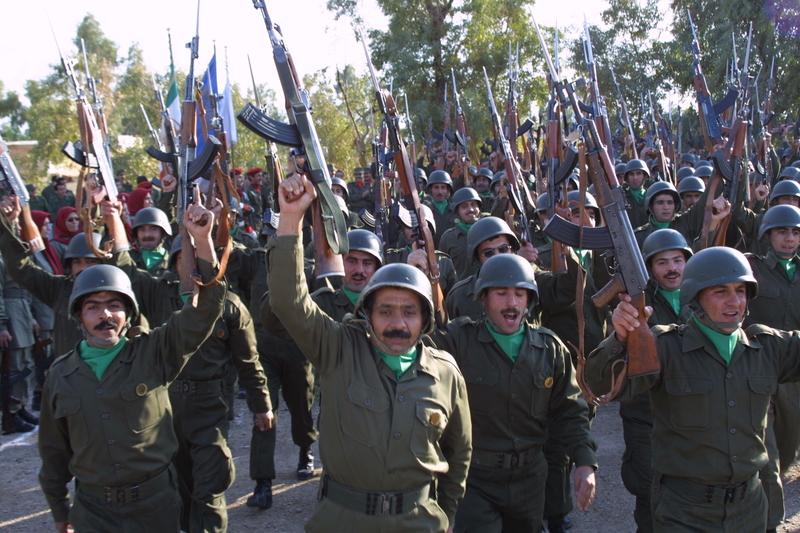 Whether staying in the cultic Ashraf garrison or moving from it, staying in Iraq or going to another country, or going to Europe or to some other place, will not make any difference so long as the cultic structure of the MKO – which is the basis of its terrorist characteristic – is in place and destructive mind control techniques are systematically applied. 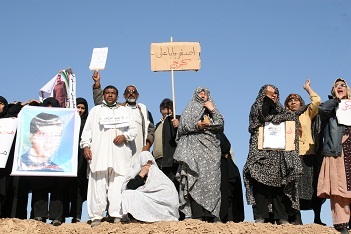 What all entities are in agreement with is that the Ashraf inhabitants must enjoy the minimum of freedom. Will the individuals have the right to visit their close relatives in the new base? Will they have access to the outside world? Will they be able to think freely and decide for their own destiny? Will the brainwashing techniques still be in use? 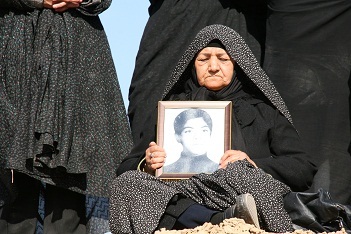 Will the families' concern about their loved ones eventually be ended? Unfortunately those parties who praise the MKO just for accepting to leave Ashraf garrison are not ready to answer these questions. We must act in the interests of the suffering families who have no voice in this dilemma. Each party is after their own political interests. 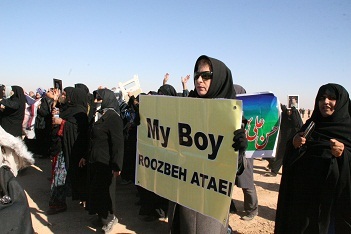 Rajavi’s desire is to keep the cultic structure of his group intact and keep the members isolated from the outside world. So far, thanks to the weak positions adopted by the parties involved, not only has he achieved that goal, but apparently he must be rewarded and we must come to the conclusion that he is no longer a terrorist. 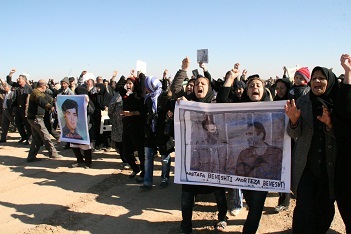 The suffering families of the members trapped inside the MKO will stay firm in their struggle until they reach their goal which is for their loved ones to have the chance to think freely and decide independently, and they will not be deceived. The only way their loved ones can reach liberty is to insist on the just demands they have been demanding for the last two years outside Ashraf garrison. 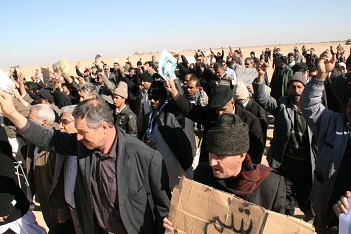 As you know, an agreement has been struck between UNAMI, the Iraqi Government and the leaders of the Mojahedin Khalq Organisation according to which the camp should be evacuated by the end of year 2011. 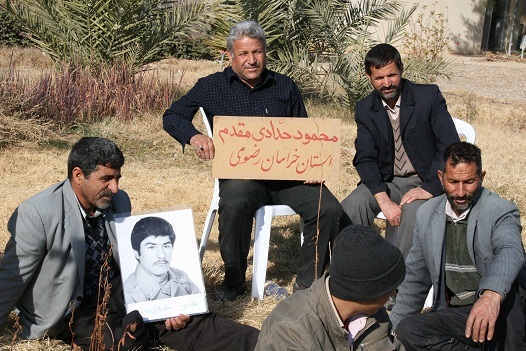 Also, according to this agreement the deportation of Mojahedin Khalq will be delayed by another 6 months in which time the UNHCR would be able to register the residents and carry out individual interviews in preparation to transfer them to other countries. 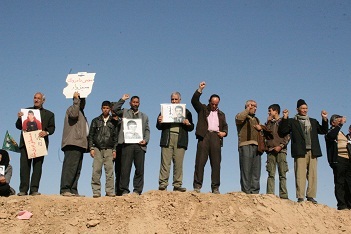 According to the Memorandum of Understanding, an initial 400 of the residents of Camp Ashraf are to be transferred to the former American Camp Liberty adjacent to Baghdad Airport, but to this day, 30th December 2011, the leaders of the Rajavi cult have rejected the planned transfer by bringing all sorts of reasons and excuses, clearly against the agreements accepted by the other two parties involved (UNAMI and the GOI). 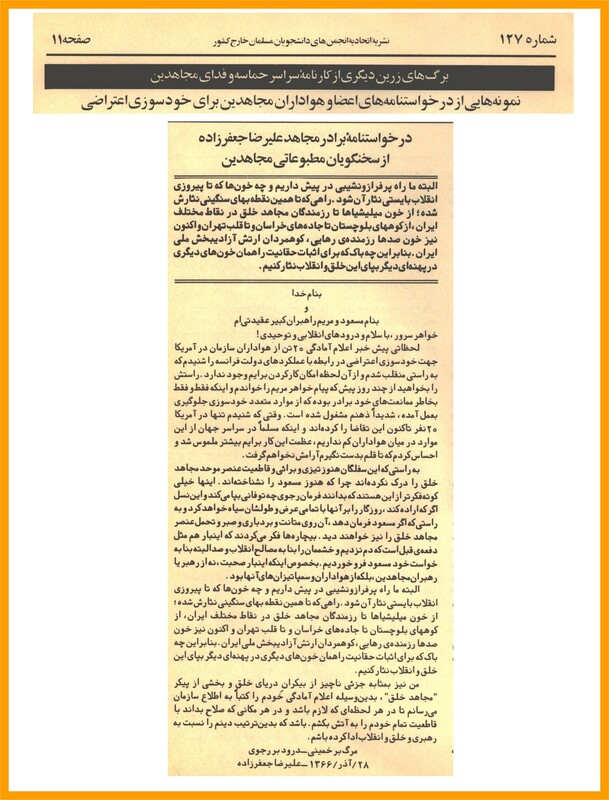 Today it is clear to everyone that the leaders of the Rajavi cult like all similar cults anywhere in the world which use destructive mind control methods do not see themselves bound by their words or their signatures. It is now clear that they are more than anything else afraid that their forces (hostages) would run away during this transfer. 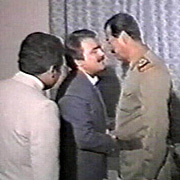 Sooner or later, Rajavi will have to give up Ashraf garrison - which is situated on land illegally and forcefully confiscated by his benefactor Saddam Hussein where he built a military base which he later gifted to the Mojahedin Khalq. Sooner or later he will have to face the fact that the members will be deported from Iraq. It is worth mentioning the continuous hard work of the families of the people trapped inside the camp who have stayed by the camp for the last two years and demanded their human rights from their base, which they call Freedom City, built adjacent to Camp Ashraf. 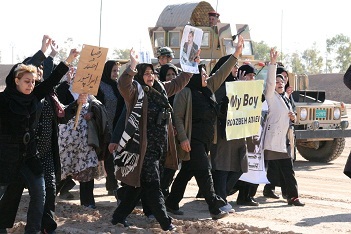 They exposed the lies of Rajavi and they proved that the leader of the Mojahedin Khalq cult has no respect whatsoever for the people and the loved ones taken hostage inside the camp. It is now clear to everyone that it is the fathers, mothers, children and spouses of the trapped people who represent the best interest of the hostages and not the leaders of the cult. The agreement between all parties to sort out the problem of Camp Ashraf could not have been achieved without the hard work and the suffering of these families, especially during the last two years. 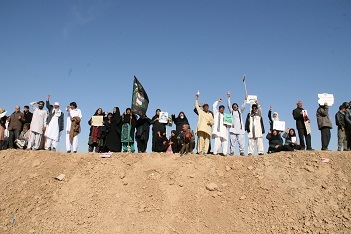 They have worked flat out for the last two years in Freedom City, adjacent to Camp Ashraf for two years and intend to do so for as long as it takes. 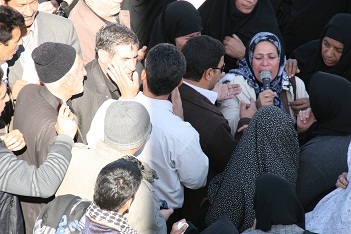 It is clear that even after the transfer of Rajavi's hostages to a new location, the families will not rest until they achieve their minimum demand of private visits with their loved ones. The hope of reaching this goal is now greater and nearer than ever and the number of families is continually increasing in number. They have all decided to finish the quest that began two years ago and to not give up until they have achieved their simple humanitarian demand of 'Right of Visits' with their captured relatives. 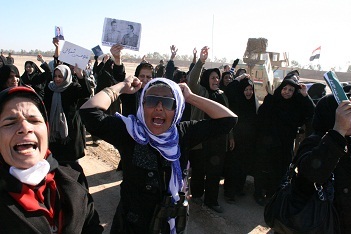 SFF on behalf of the picketing families would like to extend its appreciation to all the survivors and ex-members, as well as human rights activists in Iraq, Iran and other countries who have been aiding and supporting the families and helping their voices be heard in the world. With the hope that one day soon the goal of the freedom of every one of our loved ones takes the tiredness of all these years off our bodies. 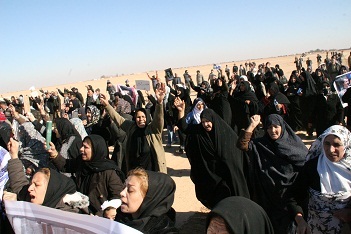 A large number of families of Camp Ashraf residents gathered in front of the Camp, this morning, reported Nejat Society representative. 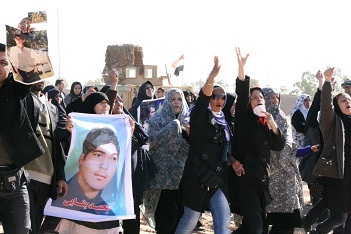 Families of Ashraf prisoners chanted slogans to once more announce their call to visit their loved ones. Local and foreign reporters are present in there in order to broadcast the news of the region. 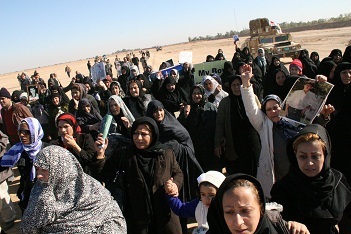 As it was also reported 100 residents of Camp Ashraf are relocated in Camp liberty, a site near Baghdad international airport, today. Families are hopeful to see or at least get news of their children --after years of no news about them-- while they are transferred from Ashraf to Baghdad.